"Delicious herbs fill the matzo balls with great flavor, and the long-simmered soup is so good. If you make it in a pressure cooker, the chicken soup can be ready in 45 minutes." To make the soup on the stovetop, combine chicken, onions, celery, carrots, dill, bay leaf, and 3 quarts water in a large pot. Bring the water to a boil, reduce the heat, and simmer, partially covered, for at least five hours. Skim the surface of the soup occasionally to remove any foam that develops. Remove the chicken and vegetables from the broth; discard vegetables. Strain the broth, cool, and refrigerate overnight. When chicken is cool enough to handle, remove the chicken meat from the bones, and chop or shred the meat; cover and refrigerate. To make the soup in a pressure cooker, add chicken, onions, celery, carrots, dill, bay leaf, and water to the pressure cooker as directed in step 1, seal the pressure cooker, and bring it up to full pressure. Reduce the heat, maintaining full pressure, and cook for 30 minutes. Allow the pressure to drop naturally. Remove chicken and vegetables from broth. Strain the broth; discard vegetables. When chicken is cool enough to handle, remove chicken meat from bones as directed in step 2. Combine vegetable oil, eggs, basil, parsley, 1 1/2 teaspoons salt, and black pepper in a bowl; mix well. Stir in the matzo meal, cover the bowl with plastic wrap, and refrigerate 1 hour. Bring at least 3 quarts of water, or as needed, and 1 teaspoon salt to a boil in a large pot. Using wet hands, gently shape the matzo mixture into balls about 2 inches across and drop them in the boiling water. Simmer for 20 minutes. Skim the fat off the chilled chicken broth and place broth in a pot over medium heat. Add salt to taste and the reserved cooked chicken, if desired (see Cook's Note). 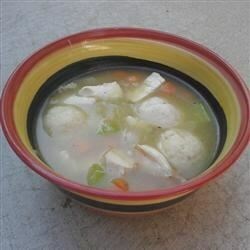 Transfer the cooked matzo balls to the chicken soup and heat to serve. For the Angel family, matzo ball soup means tradition. You may use any finely chopped herbs you like in the matzo balls: basil, parsley, dill, rosemary, and/or sage. Add the cooked chicken to the soup, if desired (or you can use it to make chicken salad). This was a good base but required a lot of additional spices to have any flavor. Awesome, flavourful recipe. Matzo balls are amazing, and the broth turned out well too, although I left out the dill. Definitely in the regular rotation.